Signed match-worn shirts from every player involved in the World Cricket Tsunami Relief match and the coin tossed by Australian Prime Minister John Howard would be auctioned online, with all proceeds going to World Vision’s tsunami relief fund. In video: Ganguly plans auction to help tsunami victims. Skipper Tatenda Taibu hit 92 and Elton Chigumbura scored 71 as Zimbabwe avoided following on in the first Test against Bangladesh here today. West Indies skipper Brian Lara racked an unbeaten 116 off 86 balls to inspire the tourists to a four-wicket victory over Australia A in the one-day cricket match here today. The Pakistan cricket team would arrive on February 25 for a 45-day tour of India to play three Tests and five one-dayers, the dates of which have been tentatively decided. It was a game that served a purpose loftier than victory. No wonder the calculations of smart play remained insignificant as Chandigarh Press Club took on Lahore Press Club members during the friendly cricket match at Punjab Cricket Association Stadium in Mohali today. Thailand's Paradorn Srichaphan overcame a fighting Tomas Zib of Czech Republic 7-6 (7-5), 6-3 to enter his fourth successive ATP Chennai Open final here tonight. Srichaphan, who won the title in 2003, now awaits the winner of the match between defending champion Carlos Moya and Guillermo Garchia Lopez. The top-seeded Indian/Swedish combination of Mahesh Bhupathi and Jonas Bjorkman stormed into the doubles final of the Chennai Open ATP World Tour Tennis Championship with a straight set win in the semifinals here last night. Slovakia clinched the Hopman Cup for the second time when they crushed Argentina 3-0 in today’s final. Elena Dementieva cruised past defending champion Venus Williams 6-3, 6-2 today to win the Hong Kong’s Champions Challenge tennis tournament. Dementieva of Russia, ranked sixth in the world, broke Williams three times in the first set, while losing her service once. CRPF Jalandar lifted Phagwara Cup in the club category today by defeating JCT Academy, Phagwara, by 2-0, while Layallpur Khalsa College Jalandar retained the title by defeating DAVC Jalandar by 1-0 goal in the college category on the concluding day of the seven-day 18th Phagwara Cup Football Tournament organised here this evening. Grandmasters Krishnan Sasikiran and Abhijit Kunte shared the lead with seven points from eight rounds in the third Parsvnath International Open Chess Tournament at the Bapu Samaj Sewa Kendra here today. Rich tributes were paid to former Olympian Balkrishan Singh at his bhog ceremony held here today. Hundreds of people from all walks of life assembled at the Moti Bagh Gurdwara today afternoon to pay their final respects to the hockey legend. PAP Zone lifted the overall trophy in men category while Jalandhar Zone and Ferozepur Zone secured second and third positions, respectively at PAP Complex near here today. In women section, Jalandhar Zone won the overall trophy. Run in conjunction with online auction specialists eBay, the auctions would begin at 15-minute intervals from today and conclude on January 11, Cricket Australia said in a statement here today. Various other events, including celebrity Kanga cricket matches and Hercules flyovers would take place during the cricket match between World XI and Asian XI at Melbourne on Monday. The next game of the two-match series is to be played in Asia sometime next month. Prime Minister John Howard will toss the coin before the start of the match, along with team captains Ricky Ponting and Sourav Ganguly. ICC Chief Executive Malcolm Speed would then be involved in a brief ceremony, which will be followed by team photographs and a moment’s silence. Sold as separate lots, the auctions are open to bidders in any part of the world, the statement said. “The shirts will be match-worn, personally signed and un-mounted, packaged with a Cricket Australia letter of authenticity. The coin used to start the match is a 40mm pure silver proof dollar coin from the Royal Australian Mint’s ‘Masterpieces in Silver 2004’ limited edition set, and will be auctioned with an additional mint condition ‘Masterpieces in Silver’ set,” CA Chief Executive Officer James Sutherland said. London: Five ICC World XI players, who would be taking part in the tsunami charity match against ACC Asia XI in Melbourne, have sent out messages of hope to the countries devastated by the disaster. Darren Gough, Daniel Vettori, Chris Gayle, Chris Cairns and Dwayne Bravo pledged their support to the cause while urging survivors “not to give up”. “It will be a brilliant game of cricket played in a good spirit and all to support people who really need our help,” England fast bowler Darren Gough was quoted as saying by an ICC media statement here on Saturday. Gough mentioned that the disaster had moved his children who had contributed their pocket money to the relief fund. “Cricket fans across the world have always enjoyed seeing players from Sri Lanka and India in action, now it is time cricket gave something back to these tsunami-hit parts of the world,” he added. New Zealand allrounder Chris Cairns said the “world must unite to assist the victims of the disaster”. Joining in the appeal to people worldwide to donate for the relief efforts, his compatriot Vettori said recovery was going to be a long haul, and “this appeal is not for one day or one week, it’s about being there for as long as it takes”. New Delhi: Not to be left behind the ICC and the Asian Cricket Council (ACC), the Marylebone Cricket Club (MCC) has decided to join the tsunami relief effort by staging a charity match and a fund-raising event besides donating 25,000 pounds. Skipper Tatenda Taibu hit 92 and Elton Chigumbura scored 71 as Zimbabwe avoided following on in the first Test against Bangladesh here today. Zimbabwe reached 308 for eight wickets at the close on the third day, still 180 runs behind in the first innings. Taibu made the most of being dropped three times to dampen Bangladesh’s hopes of a first Test victory in their 35th match. The skipper shared a stand of 119 for the seventh wicket with Chigumbura, who hit 10 boundaries and a six before being caught behind by Khaled Mashud off Mohammad Rafique. Taibu, having guided Zimbabwe past the follow-on target of 289, fell eight runs short of a first Test century when he was trapped lbw by Rafique, who finished with 4-64. Zimbabwe, who started the day on a precarious 84 for four, reached 154 for six at lunch. Bangladesh, seeking their first win since gaining Test status in 2000, went wicketless in the afternoon session as Taibu and Chigumbura both batted sensibly. Earlier, fast bowler Mashrafe Mortaza grabbed both wickets in the first session to put pressure on Zimbabwe. He struck in the day’s third over when he bowled Hamilton Masakadza, who added just one run to his overnight score of 28. Taibu and Brendan Taylor then defied the Bangladeshi attack on a slow track for more than an hour, adding 66 for the sixth wicket. Zimbabwe are playing their first Test since they were suspended by the International Cricket Council last June for fielding a weakened team after a dispute between their board and several leading white players. Fall of wickets: 1-31, 2-48, 3-59, 4-59, 5-86, 6-152, 7-271, 8-308. Lara's majestic innings was highlighted by one awesome six off speedster Brett Lee which sailed high over the wide mid-on fence, through a tree and onto the road alongside Bellerive Oval. The West Indies also got good batting performances from opener Chris Gayle (40 from 32 balls) and Shivnarine Chanderpaul (42) in a match they needed to win after being well beaten by Victoria in the first warm-up game last Wednesday. "Against Victoria everyone got into the 20s and nobody carried on," Lara said after his side reached the target of 266 for six today with eight balls to spare. "It's very important to understand that if you get a start, if you get into the groove, you've got to try as much as possible to do the job yourself. "It's nice to do it in the second match, to get a hundred and show the guys what is necessary for us to win." The victory will lift spirits with the international triangular one-day series opener against Australia in Melbourne on January 14. "We've always had the players but it's about harnessing the talent and getting it working cohesively towards winning and hopefully (new coach Bennett King) will be capable of doing it," added Lara. No bowler emerged unscathed from the Lara onslaught although Tasmanian Damien Wright's 2-40 from 10 overs came before the chairman of selectors Trevor Hohns. Along with the massive blow off Lee, there were three other sixes and 12 boundaries in the Lara innings which stunned Australia A centurion David Hussey. "I've seen a bit (of Lara) on telly but that was unbelievable today," said Hussey. "He just hit the ball unbelievably into places where you don't expect him to hit it. "He came out there and struck the ball superbly from ball one. I'm still just amazed that we lost." Hussey (128 from 123 balls) and fellow Victorian Cameron White (61 from 57 balls) rescued Australia A with a 152-run stand for the sixth wicket after skipper Brad Haddin had won the toss and elected to bat first in overcast conditions. The home side slumped to 25 for three and 102 for five before the rescue mission. The bowling honours went to Dwayne Bravo (4 for 42) and Reon King (2 for 44). Pakistan, touring the country for the first time since 1999, would also play two practice matches before returning home on April 10, cricket board Secretary S K Nair said here today. "The plan is to hold a three-day practice match before the Test matches begin and another one before the start of the ODI series," Mr Nair said. The BCCI's Programme and Fixture Committee would meet shortly to finalise the venues and the dates. However, sources said tentative dates had already been sent to the Pakistan Cricket Board for approval. According to the tentative schedule, the first Test would be played from March 4 to 8, second from March 12 to 16 and the third from March 20 to 24. The one-dayers would be played on March 28, March 31, April 3, April 5 and April 9. It was a game that served a purpose loftier than victory. No wonder the calculations of smart play remained insignificant as Chandigarh Press Club took on Lahore Press Club members during the friendly cricket match at Punjab Cricket Association (PCA) Stadium in Mohali today. From start to the end, the spirit of friendship remained in command, lasting well beyond the moment that saw the Indians wresting the winning trophy. The guests were equally awarded with a trademark PCA reception, loads of genuine attention and a sparkling silver trophy that looked grand as the one that the victors’ held. Mesmerised by fine batting and bowling performances by the Chandigarh team led by Prabhjot Singh, the Pakistani players actually vowed to come prepared the next time. All of them went in for a series of clarifications behind their not-so-convincing score (112 all out). “We have not practiced at the nets this season, the field is all new to us and we have not been all that resistant. Your wicket keeper Prabhjot Singh was outstanding,” admitted Rana Ikram of the Daily Din who is a regular member of the Lahore Press Club cricket team. Low on practice and resistance, the Pakistani team gave in fast, as Indian bowlers began the damage in the very first over when Maneesh Chhibber took two wickets. Kamleshwar Singh bowled an exceptionally good line, claiming three wickets. Spinner Sanjay Kalia proved to be the most economical bowler with his five overs for just 15 runs. He took two wickets. Jaipal Singh, Rohit Awasthi and Gagan Sethi took a wicket each. Indians managed a comfortable score, with their strong batting line up by Captain Prabhjot Singh. In fact, Pak Captain Moeen Ahmed’s decision to bat first on a moist wicket did not yield much benefit as the wickets fell very quickly. Least disheartened by the defeat, the Pakistanis took the occasion to celebrate the spirit of sport. Exchanging notes with Indian journalists, the players talked of how very important were indoor games in Lahore. 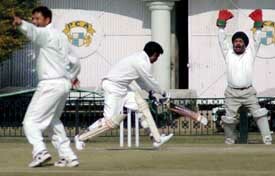 Lahore Press Club regularly organizes sports tournaments including those of cricket, carrom and table tennis. Rana Ikram, one of the Lahore Press Club members who played at PCA today, has been a carrom champion with 13 centuries to his credit during the last year’s competition. As for performance by the Lahore team today, most players said they were out of practice and were not accustomed to the wicket. Some said their shoes were not very friendly on the ground, and losing grip. The guests were however elated to have sports kits, arranged at the drop of a hat. They were equally smitten by the PCA hospitality and of course its lush field. Thailand's Paradorn Srichaphan overcame a fighting Tomas Zib of Czech Republic 7-6 (7-5), 6-3 to enter his fourth successive ATP Chennai Open final here tonight. Srichaphan, who won the title in 2003, now awaits the winner of the match between defending champion Carlos Moya and Guillermo Garchia Lopez. The Thai had lost to Moya in the final last year.The tense semi-final encounter saw the second seeded Srichaphan emerge victorious after a 114-minute contest at the Nungambakkam tennis stadium here. Srichaphan was meeting the unseeded Zib for the second time in five years with Srichaphan leading the head-to-head count. 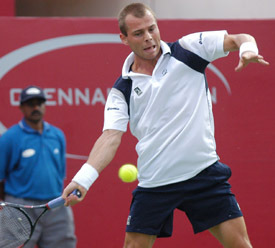 Zib had lost to Srichaphan 4-6, 5-7 in a first round tour match in Ho Chi Minh city in 1999. The Thai was thoroughly tested in the first set which went to the tie-breaker. Zib was faster on court and in his shot production, and Srichaphan was in a spot of bother. The Czech went into the lead 3-1 with a second game break. Though, Zib was broken back in the sixth, he never relented. In fact, Zib accounted for 20 winners in the match compared to just 12 by Srichaphan. Both were equal to the task but Zib rarely failed with his eye-catching deep returns and on a few occasions, Srichaphan played into his hands by serving and returning wide, giving leeway for the Czech to attack. Zib almost came up with double breaks in the ninth and eleventh. On both occasions, Srichaphan had to dig deep and raise his game. He managed to save a break point each and then managed to hold on to his service games. Zib, ranked way down at 150 to the Thai's 27th rank on the ATP list, played flawlessly and gave a fright to Srichaphan in the 11th game where the latter managed to save two break points, winning the game on the fourth deuce. In the tie-break, Srichaphan was under pressure when he surrendered the initiative of 4-1 lead and then allowed Zib to level 5-5 before winning the next two points including an ace for the set. Srichaphan was never given any liberty in the second set as well as Zib constantly counterattacked from the edge of the baseline, except on a few occasions, when the Thai came up with intelligent lobs to bamboozle Zib. However, the Asian number one, supported by a partisan crowd, secured two breaks in the 5th and ninth games, to win the set and match, realising his goal of making the final this year also. The potent Indo-Swedish combination survived some anxious moments in the second set before wining against the scratch pair of Kevin Kim (US) and Jiri Vanek (Czech) 6-2, 6-3 in an hour and 10 minutes at the centre court here. In the final tomorrow, the duo would meet the winner of the other semifinal between Leander Paes and Nenad Zimonjic of Serbia and Yen Hsun (Taipei) and Rainer Schuttler (Germany). It was quite an easy outing for Mahesh and Bjorkman, before they drowned themselves in errors in the second set. However, they struck a purple patch when it mattered most and wrapped up the contest on the second match point when the Swede came up with a superb backhand drop volley. Mahesh and Bjorkman won the first set 6-2 rather easily, before the Indian dropped serve in the first game of the second set. The US/Czech pair found Mahesh’s backhand as the weak link and went on to win points. This put additional burden on Bjorkman, who had to run around a lot. Either in intercepting the ball at the net or finishing the rallies with fine work at the net, Bjorkmann proved his class. Mahesh, too, on his part came back on his own with superb lobs, testing the patience of Vanek and Kevin. Mahesh and Bjorkmann found the much-needed break in the sixth game to draw level at 3-3 before reeling off the next three games in a row, with yet another break this time, breaking Vanek’s serve at love in the eighth game to seal the issue. Mahesh had some problem in his first serve and double-faulted on a couple of occasions. He nearly lost serve before the Indo-Swedish pair staved off two break points. 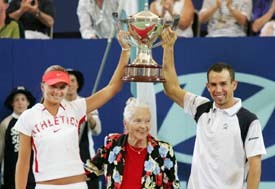 Slovakia clinched the Hopman Cup for the second time when they crushed Argentina 3-0 in today’s final. Daniela Hantuchova and Dominik Hrbaty had given Slovakia an unassailable 2-0 lead before they won the final mixed doubles via a walkover because of Guillermo Coria’s sore back. Former world number five Hantuchova recovered from a terrible start to beat Gisela Dulko 1-6, 6-4, 6-4 and put the third seeds ahead. Hrbaty, who had not lost a set in his three singles matches in the group stages, then upset world number seven Coria 6-4, 6-1 to help erase the memories of 2004 when the Slovaks lost to the USA in the final. ‘’I would like to congratulate Daniela,’’ Hrbaty said. ‘’I was so nervous watching her today, I almost had a heart attack. World number 14 Hrbaty was in imperious form as he sauntered past Coria in just 58 minutes. The Argentine struggled with a sore back in the second set but Hrbaty showed no mercy in wrapping up victory with another backhand winner. World number 31 Hantuchova, ranked two places above Dulko, had won two of her three matches in the run-up to the final but looked nervous as she dropped the first four games of the match. Dulko, who had lost all three of her singles matches in the group stages, grew in confidence and took the first set in just 27 minutes before Hantuchova hit back in a second set littered with breaks to draw level. Dulko had an early chance to break in the second game of the deciding set, but the contest stayed with serve until the seventh game when a double fault from the Argentine gave Hantuchova the vital break. With Coria nursing his back, the walkover completed a 3-0 win, although Hrbaty and Hantuchova beat Dulko and her brother Alejandro 8-4 in an exhibition pro set. Elena Dementieva cruised past defending champion Venus Williams 6-3, 6-2 today to win the Hong Kong’s Champions Challenge tennis tournament. Dementieva of Russia, ranked sixth in the world, broke Williams three times in the first set, while losing her service once. The 24-year-old American put up a stiff fight when 5-2 down in the second set, saving three championship points before losing the match at the Victoria Park tennis court. It was Dementieva’s first win since her victory at Hasselt in Belgium last year, and it boosted her confidence ahead of this month’s Australian Open. Somarjeet scored both the goals for the CRPF. The first goal was scored in the 43rd minute of the first half, while the second in the 40th minute of the second half. The JCT Academy made several brilliant moves but their players fumbled in front of the rival goalmouth. Local team squandered several chances of scoring. The CRPF got the Cup and Rs 25,000 cash prize.The JCT Academy got Rs 11,000 as prize for the runners- up. In the college category, both Layallpur Khalsa College and DAV College Jalandar were draw after the conclusion of the regular time. Sunil of Lyallpur Khalsa College Jalandar scored the winning goal in the 10th minute of the first half of the extra time,enabling his team to retain the title in the college category. The winners were given a Cup and Rs 11,000 as cash prize while the runners- up got Rs 5,000 as cash prize. Mr Raj Mohan Singh, Director (Operations) JCT Limited, gave away the prizes to the winning Clubs. Sant Baba Malkiat Singh Padhianawale gave prizes to the winning college teams. In a stunning upset, K. Ratnakaran beat Grandmaster Dmitry Kayumov. In a Gyuicco Piano game, Ratnakaran had early success and the game, was heading towards a draw when the Uzbek GM went for a queenside pawn wave, and Ratnakaran sacrificed an exchange, before going for a kingside attack to Pocket full points in 53 moves. Top-seeded Sasikiran was pushed to the wall before he regrouped himself, saving a precious half a point against International Master Enamul Hossain of Bangladesh. In a Slav game, Sasikiran went for an early assault as both players had castled on the opposite sides. But the Bangladesh player put up a spirited defence and in the ensuing tussle, called the shots to emerge triumphant. Hossain tried a few endgame tricks before signing peace after 60 moves. Abhijit Kunte moved on to the leaderboard with a quick victory over Grandmaster-norm holder Deep Sengupta. In the longest game of the event yet, B S Sivanandan drew with K Visweswran after 163 overs and six hours of play. Prominent among those attended the ceremony were Patiala MP Mrs Preneet Kaur, ADGP and President of the Basketball Federation of India Mr Rajdeep Singh Gill, three-time Olympian Balbir Singh (senior), SAI Executive Director (Teams Wing) M.P. Ganesh, Mayor Vishnu Sharma, Assistant coach of the Indian Hockey team in the 1992 Barcelona Olympics Sukhvir Grewal, hockey olympians Ms Rupa Saini, Mukhbain Singh, Harmeek Singh, Hardeep Grewal and former chief coach of the women’s national squad Mr G.S. Bhangu. Gurdev Singh of Ferozepur Zone was adjudged best male athlete, who secured first position in shot put event with a distance of 17.73 mtrs while Navjot Kaur of Jalandhar Zone was adjudged best female athlete, who won gold medal in 100m run in 13.13 seconds. The Punjab Power and Irrigation Minister Mr Lal Singh gave prizes to the players.